If you are short of inspiration this bank holiday weekend, you will find a wonderful tonic at Pick Me Up, the UK’s contemporary graphic arts festival that runs until 5th May at Somerset House. 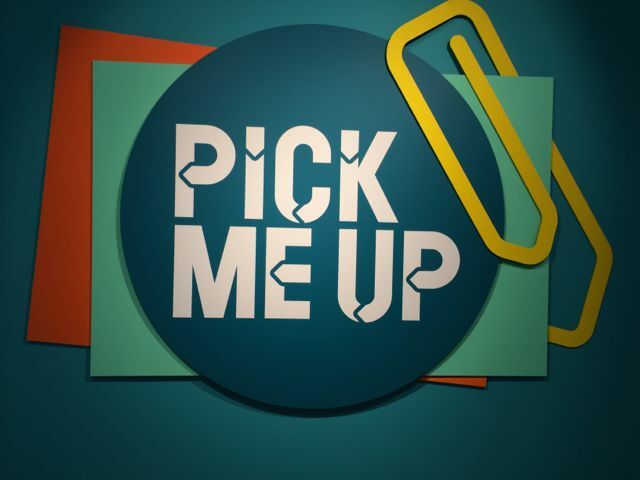 Pick Me Up is a fun and informal festival. After the more sedate gallery on the ground floor, the mezzanine is bursting with colourful, eclectic and quirky studios. The daily events are hosted with such enthusiasm that even the most timid of amateurs can dive in. When I visited Handsome Frank artist Sarah Maycock was leading an interactive day of blind drawing. Large cardboard boxes were arranged around a central table of still life objects. Budding artists sat with their drawing hand inside a box and drew what they saw. The results were surprisingly good. A great exercise in recalibrating the relationship between hand and eye, and releasing inhibition, that I will be replicating at home. 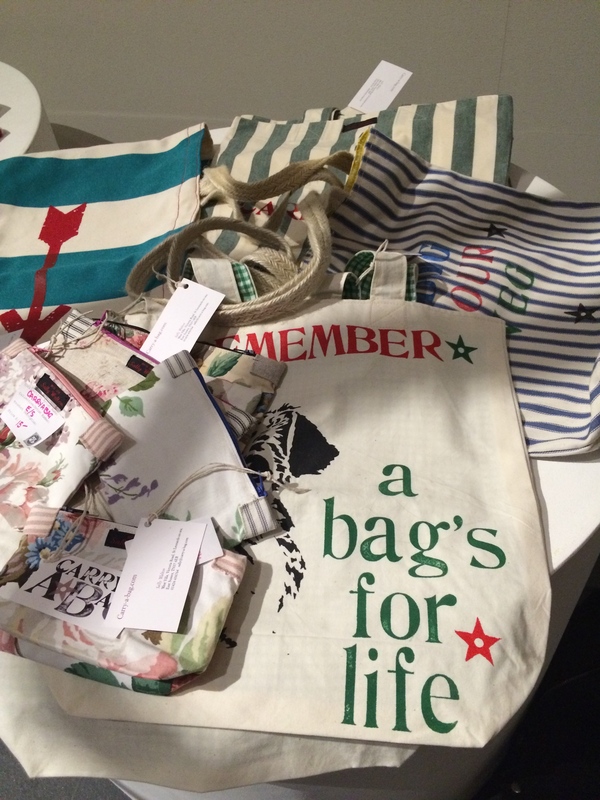 I attended with intent, and made a beeline for the collaboration between Carry-a-Bag and Heal’s hosted by Outline Artists. Outline Artists, Hvass & Hannibal designed Herbarium (pictured left), one of ten new fabrics from Heal’s as their first textile collection since the 1970s. The colourful designs include work from emerging as well as established designers, such as Zandra Rhodes. There was a hive of activity in the event space with a steady hum from two sewing machines. After adding my name to the list, I was handed a bag liner to personalise, if I wished, with a range of stamps. “Act upon your dreams” were my bon mots to accompany my choice of Heals’s 1810 Killary fabric in Cloud study. Ever the dreamer on a bright, sunny day! Once I had prepared my liner the bag was swiftly pinned, sewn and ironed by the experts while I browsed the rest of the show. 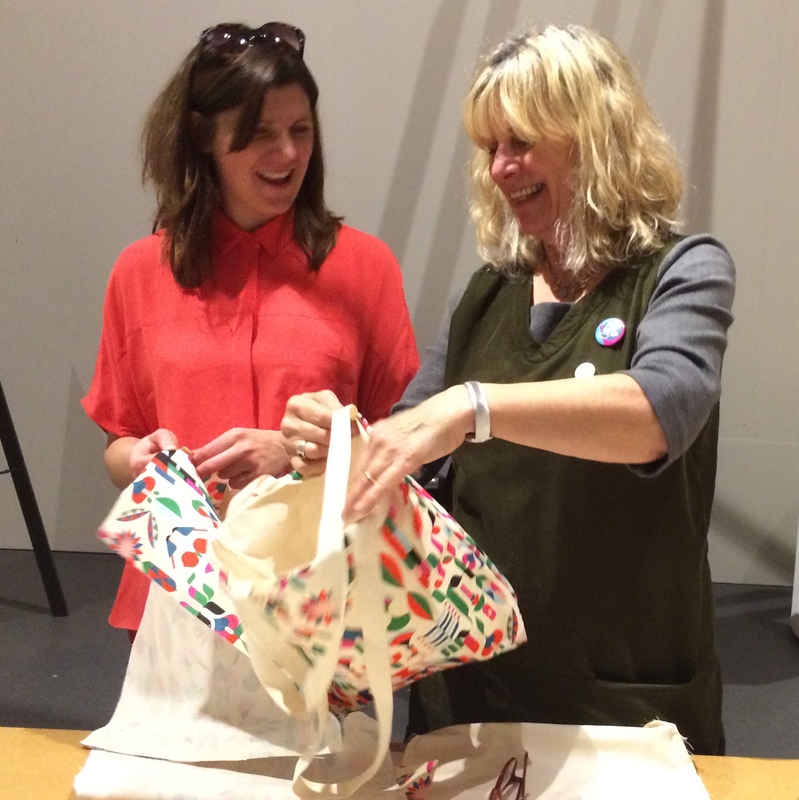 Sally Walton (pictured on the right) started Carry-a-Bag, making bags from a mixture of vintage fabrics and organic cotton, in 2005. Her previous collaborations include Liberty’s and Aveda. I treasure a floral make-up bag (pictured right) that was originally filled with Aveda travel products. 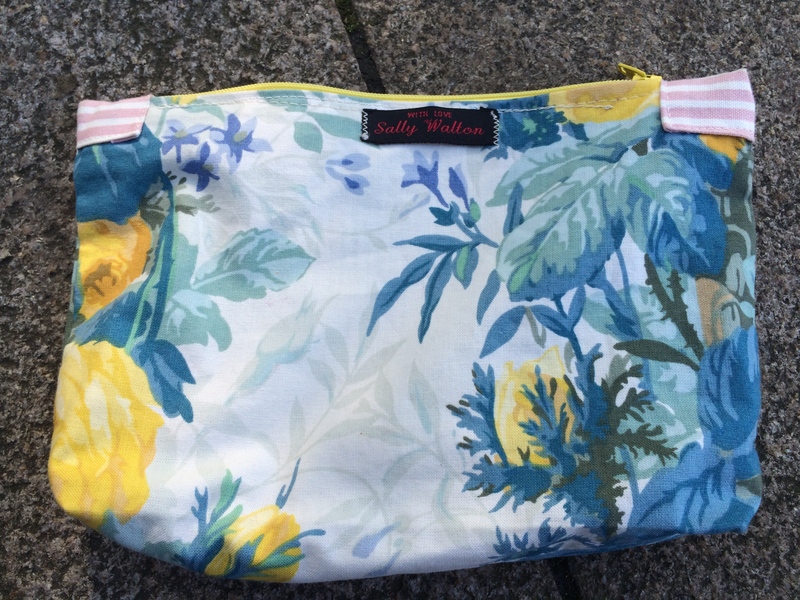 By their very nature the bags are all limited editions as they are made of vintage fabrics. 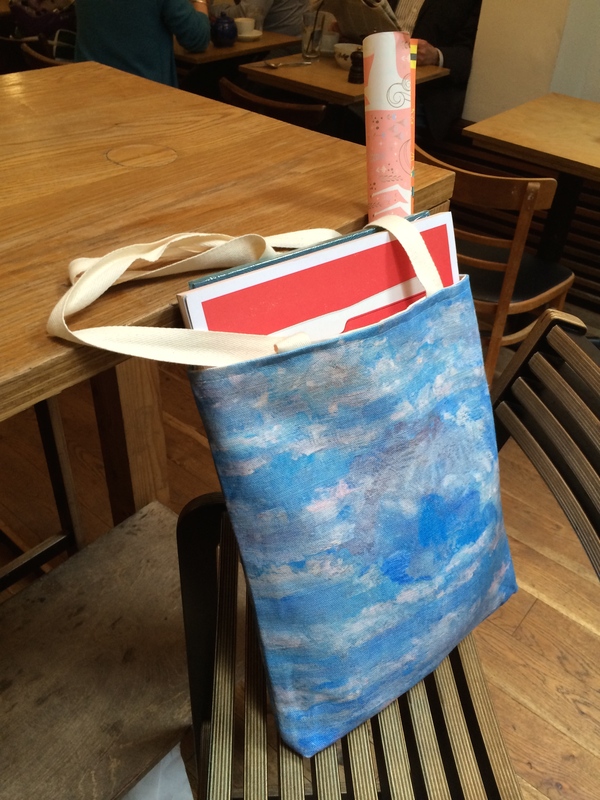 The bags are available online, priced at £25 for a tote. Your bag is perfectly personal to you, and what a better way to get yourself prepared to say no to a plastic bag when you go to the supermarket. In 2012, supermarkets in the UK gave out over 8 billion single-use carrier bags, that’s over 120 bags per person and about 60,000 tonnes of waste (source DEFRA)-quite some footprint! Plastic bags are a very visual blot on the landscape as litter and also harm wildlife. Many single use carrier bags are made of oil-based plastic (a non-renewable resource) and 86% of them end up in landfill where they can take up to 500-1000 years to decompose, if they ever do break down. Other options are available to us. I often wonder if people had to ask for a bag, rather than being offered one, would they use fewer? As a step towards changing incentives the UK Government is introducing a 5p charge on all single-use plastic carrier bags in England in October 2015, four years after Wales introduced a 5p charge in 2011 (Northern Ireland did so in 2013, and Scotland is introducing a charge this year). As the experience in Wales shows, people can change their behaviour. There was a 76% drop in the distribution of single-use bags in the year after the charge was introduced. A Carry-A-Bag makes even everyday errands that bit more beautiful. 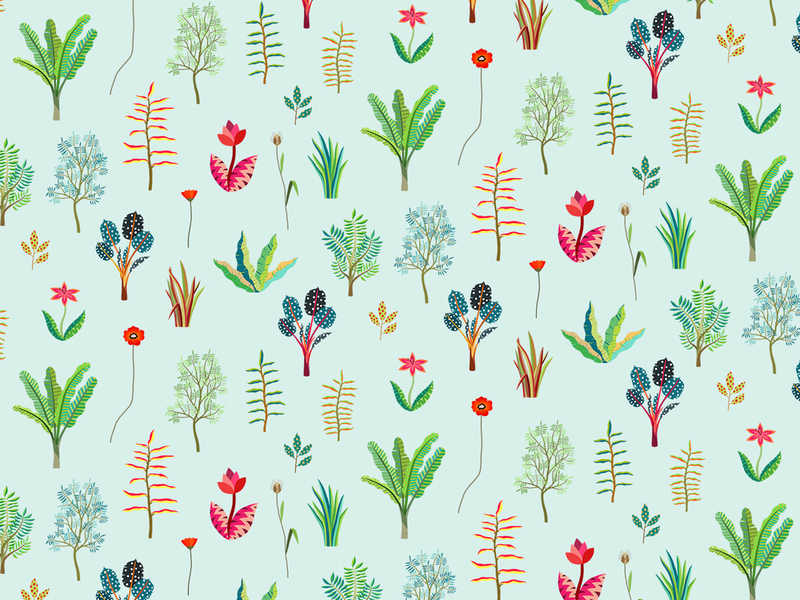 And all those vintage florals are bang on trend this summer! Back at Pick Me Up, you can pick up affordable works from the most innovative graphic art collectives, galleries and organisations of the moment. It was a good job that I had my new tote to hand to take home my haul!